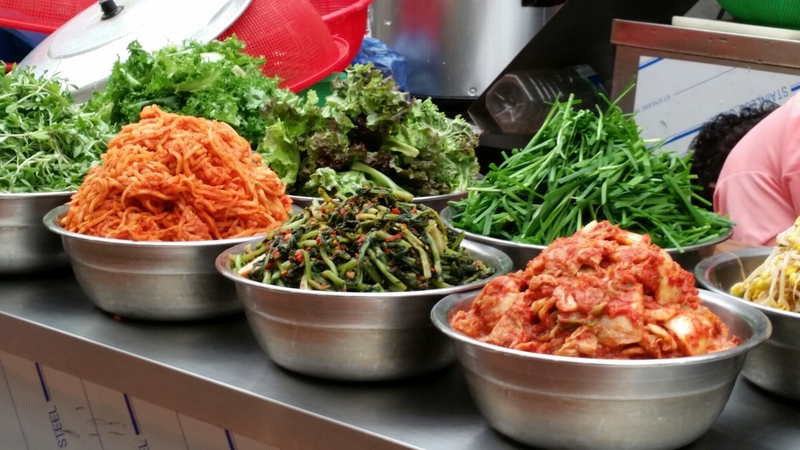 -everything north of the Han River & everything south of the Han River. 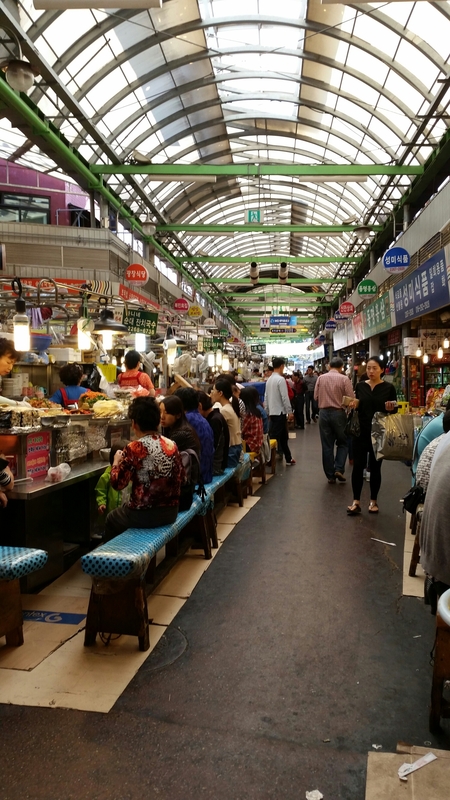 Myeongdong is located north of the Han River, and I think this area is really ideal if you’re coming to Seoul for the first time. 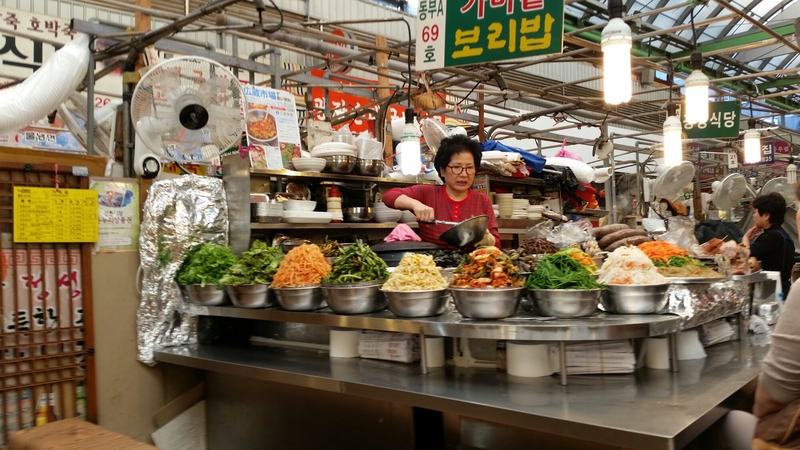 All of the main attractions & areas you’ll want to visit are mostly located north of the Han River. For example, Myeongdong, Gyeongbuk palace, Changdeokgung palace, Hongdae, Bukchon Hanok Village, etc. etc. 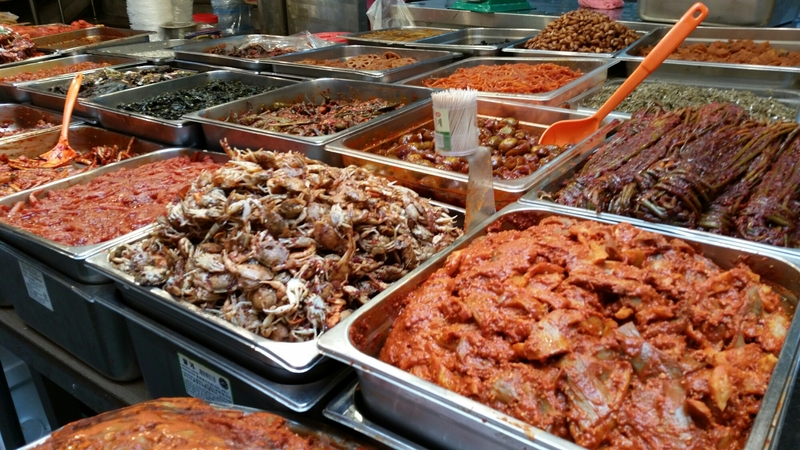 I’d heard that Myeongdong was the place to hyper-shop, but WOW, when I had arrived I could have never imagined the crazy, crowded, endless store after store shopping mecca that it really was. Myeongdong stores open mid-morning, but everything really starts to come alive as soon as it starts to get a bit dark. The alleyways get busier and louder with more street vendors, food carts, people, and stores cat-calling for you step inside & spend some money. It’s definitely a place to experience. 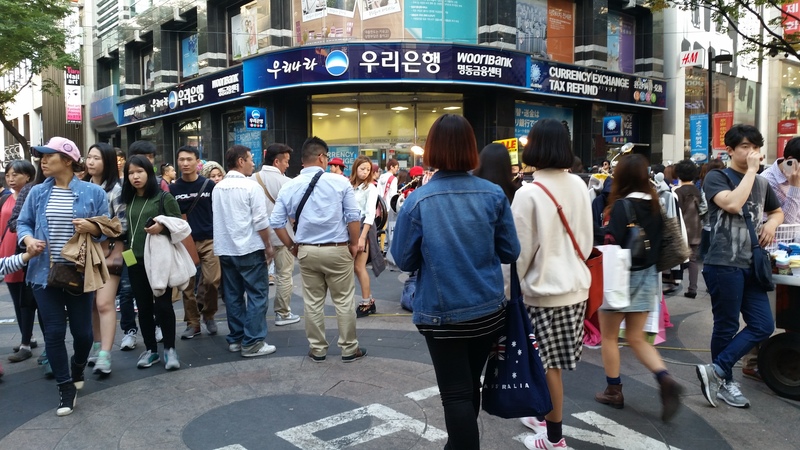 Since Myeongdong was my home base it was definitely easy to get around. 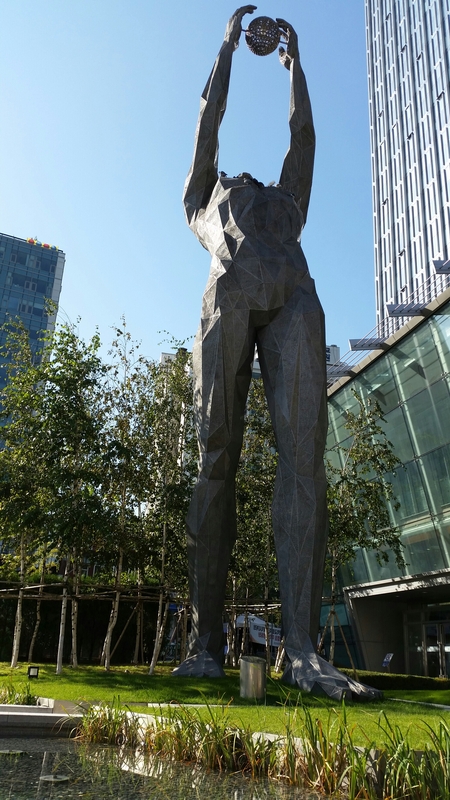 One of this first areas I decided to go was Cheonggyecheon & Gwanghwamun market. 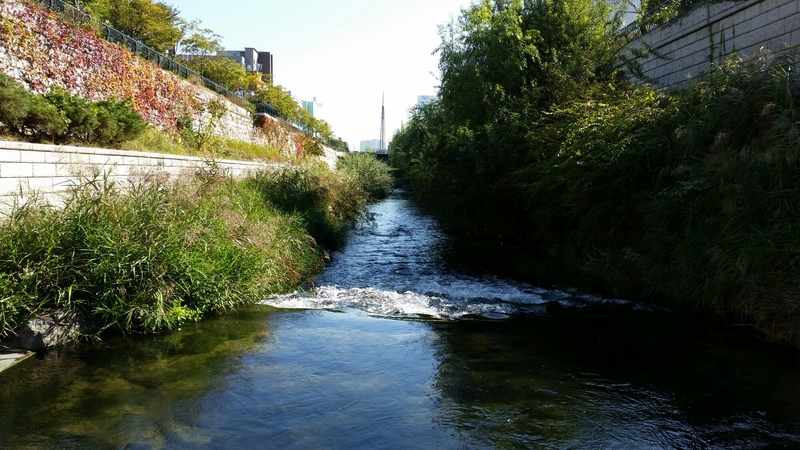 I took a nice stroll through the Cheonggyecheon stream to get to Gwanghwamun market. By the way, this is something I recommend everyone do; walk around to really take in and experience all of the sights, sounds, and smells of the city. 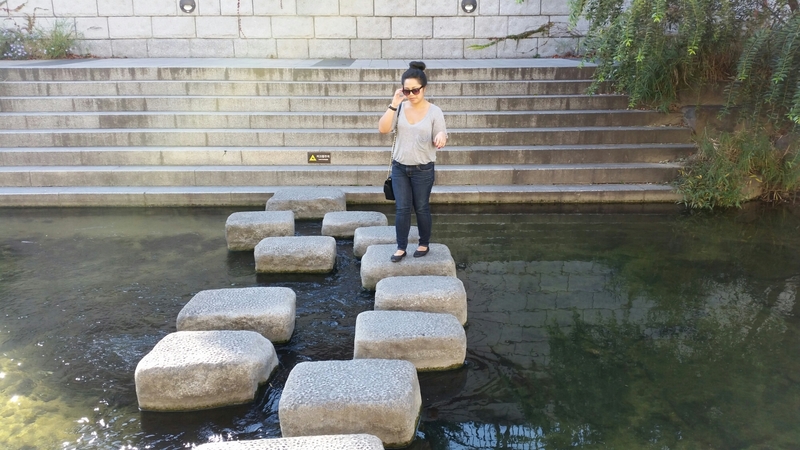 Cheonggyecheon: Walking through to get to Gwanghwamun market. 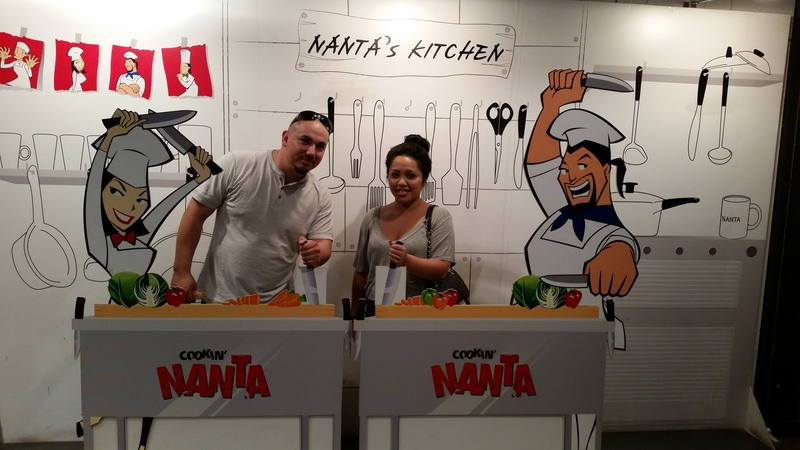 Back in Myeongdong for the Nanta Theatre “Cookin’!” show. A nice break from all the eating & shopping. FYI for picture above: Those were not fries!! 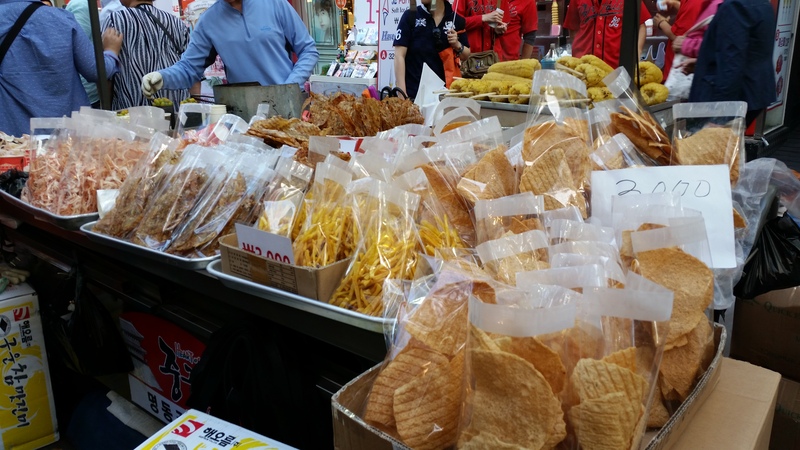 I’m glad I had a chance to experience a traditional market. 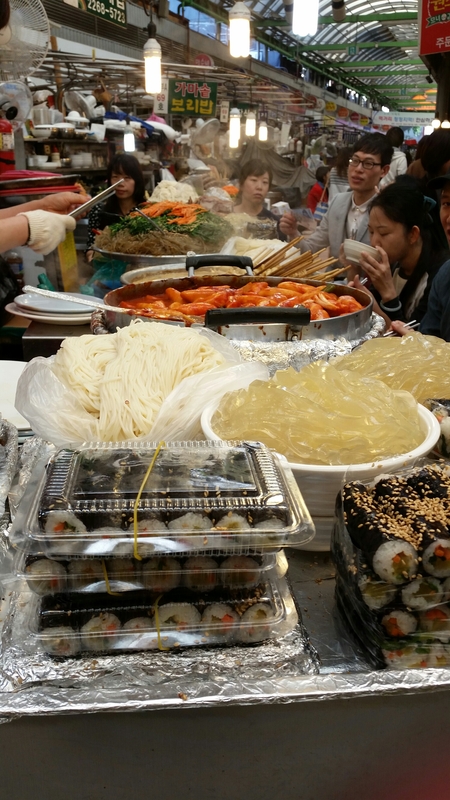 The food was really good at Gwanghwamun market. 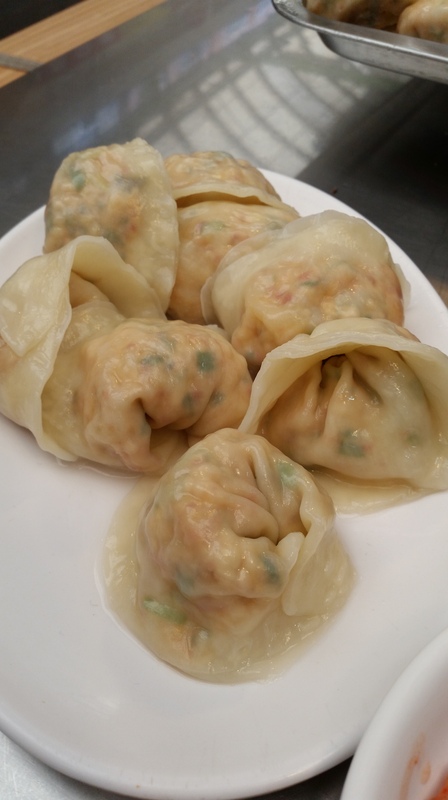 The first thing I had was the steamed kimchi mandu. 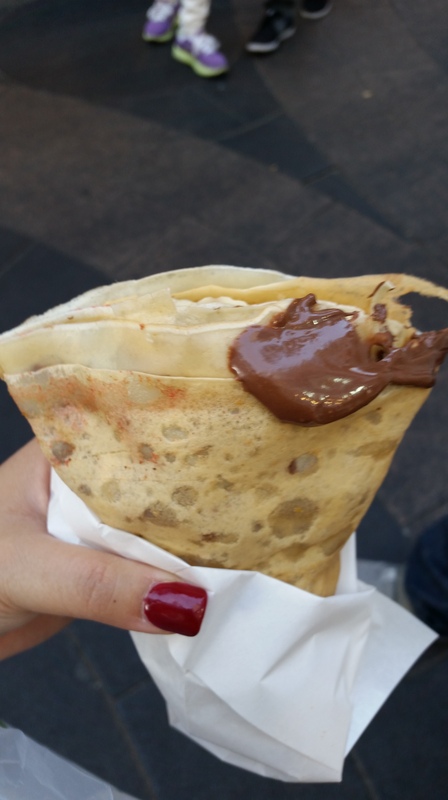 Tasted great [fed 2 people for under $5 USD], and the lady at the food stall was so welcoming. She even remembered us as we walked back by her stall; she was waving & smiling “annyeonghaseyo”!! 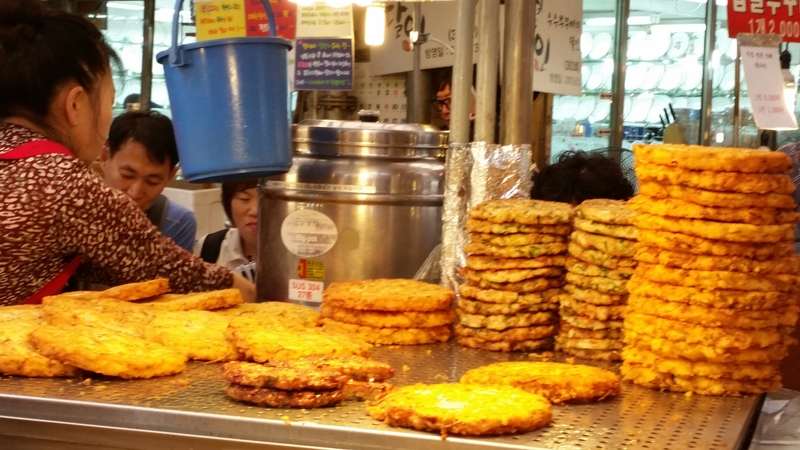 My favorite was the Pajeon [fried pancake like food made with green onions]. It was so flavorful, crunchy, full of veggies, and just plain delicious. 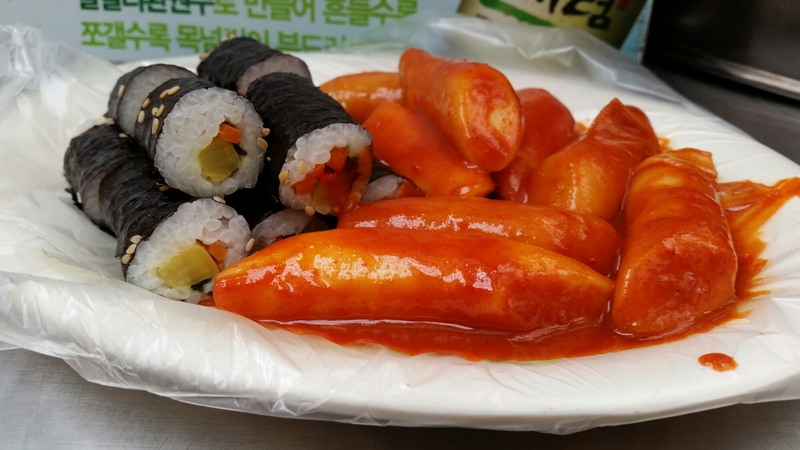 I also liked the kimbap [Korea’s version of sushi]. I didn’t get to try the Sundae [blood sausage made from intestines & other ingredients]; because I didn’t have the guts to! 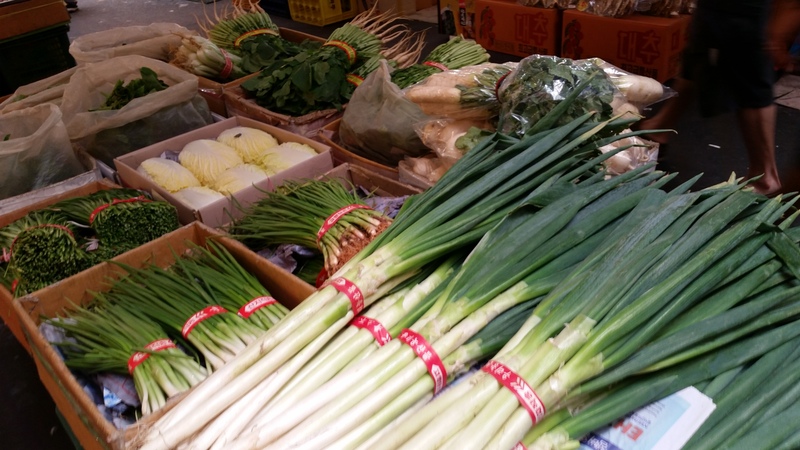 After the market it was back to Myeongdong to watch the Nanta “Cookin’!” show, and do some more walking. 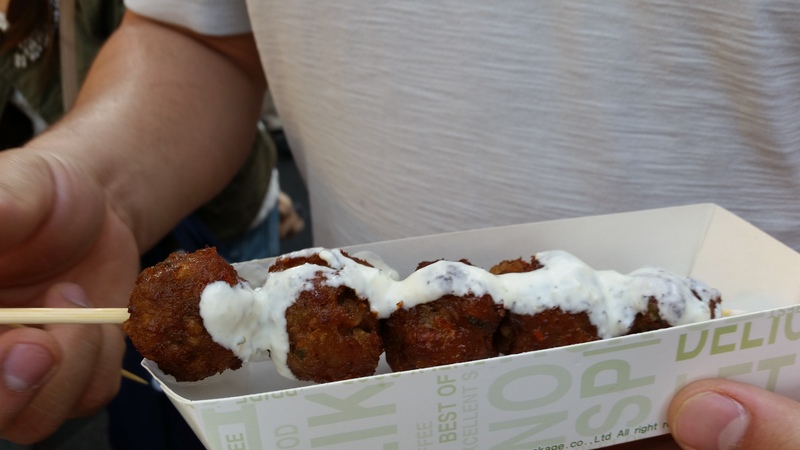 My stomach was calling for food again after a while, so I couldn’t pass by some of the street food. 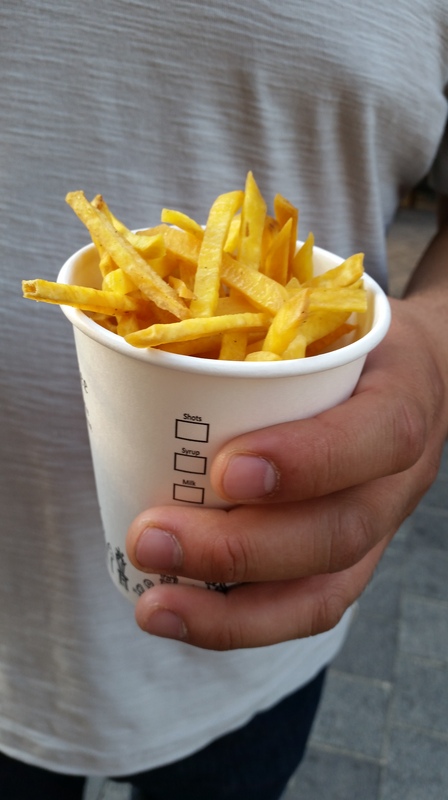 (FYI the picture above were not fries!). Finally with a fully content stomach…it was time to walk back to the hotel. See you in the next post!! I wish i could visit korea during april! Fall and spring are the best times to go! The next time I go I’ll try to visit during spring.